Indeed, as recent scientific data shows, there is another reason why cats have a title of ‘mysterious’creatures. It’s all because cats see things we cannot see with our eyes! 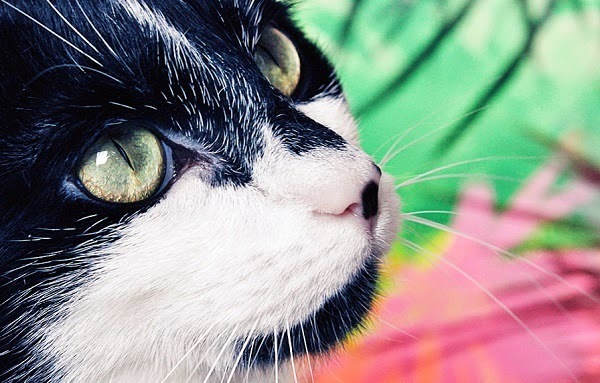 Cats, like some other animals, have the ability to see psychedelic stripes on flowers or fancy patterns on the wings of birds, which are invisible to human vision. The secret behind the super vision of our four-legged friends is the UV light. According to a recent study cats, as well as dogs and other animals, can perceive this type of light which humans can’t. Therefore, cats, dogs and reindeer can detect with their eyes animals with white fur, while most people will only see… white snow. Douglas, who specializes in optics, and Glen Jeffery, professor of neuroscience of the University College London, argue that cats, dogs, hedgehogs, rodents, bats, weasels and the okapis can detect significant levels of ultraviolet radiation. “For decades, we have known that many invertebrates such as bees see ultraviolet light,” continued Douglas, saying that even birds, fish and some reptiles were recently added to the same list. “However, scientists believed that most mammals cannot see ultraviolet light because they have no visual pigment with maximum sensitivity to ultraviolet light, but instead have lenses like those of humans, preventing ultraviolet light from penetrating into the retina,” he said. The professor explained that the visual pigments are those that absorb light and turn it into electrical activity, which, in turn, is transmitted through nerve cells. It seems that it is not always necessary for sensitivity to ultraviolet radiation. Instead, transparent parts of the eye such as the cornea and the crystalline lens in some animals transmit wavelengths of ultraviolet light. This ability allows more light to pass to the retina, “something that would be very useful for a nocturnal cat“, he continued. It could also explain why cats show so much interest to ordinary objects, such as a piece of paper. Sometimes chemical substances are added to paper, textiles, laundry detergents, shampoos and cosmetics in order to make objects look brighter. Once these optical brighteners absorb the ultraviolet light, they may look differently in the eyes of animals that are sensitive to UV rays. Some people, for example, those who have undergone cataract surgery, also can see some of the UV light, but most cannot. However, studies on reindeer have shown that repeated exposure to ultraviolet light does not bother them at all. It is possible that cats, deer and some other animals that can detect UV rays have a protective mechanism. Also, scientists believe that UV light tends to create more blur.